The ploughmeter (Fig. 76.4) is described in its current form in some detail by Fischer & Clarke (1994) who developed an earlier concept by Humphrey et al. (1993) for use at Trapridge Glacier. The core of the instrument is a ca. 1.5 m long and ca. 20 mm diameter steel rod, the lower end of which is machined into a conical tip for ease of insertion into the subglacial sediment. The rod is sheathed in a clear vinyl tube (internal diameter ca. 25 mm) beneath which strain gauges are bonded by adhesive to polished sections of the rod and the entire intervening space between the rod and sheath is filled with clear resin. Strain gauges are arranged as two sets of two perpendicular to one another near the base of the rod. The rod is hammered into the sediment via an insertion tool, the upper end of which is screwed to the base of the subglacial hammer and the lower end of which fits snugly into a cylindrical hole (ca. 100 mm long and ca. 10 mm wide) drilled into the top of the steel ploughmeter rod. The ploughmeter and hammer are lowered down the borehole together, with the total weight being taken by the ploughmeter cable to prevent the two instruments from becoming detached during lowering. Practice indicates that the most effective way of lowering requires two people—one to direct the instruments into the top of, and down, the borehole, and the other to walk the cables, which are extended down-glacier of the borehole to just over the length of the anticipated borehole depth, to the borehole. Upon contacting the glacier base, the ploughmeter is hammered into the sediment to a depth that should submerge the strain gauges (Fig. 76.4a). A bending force is then imparted on the ploughmeter, and registered by the strain gauges, as the top of the ploughmeter moves with the borehole into which it protrudes while the base ploughs through the sediment (Fig. 76.4b). Figure 76.4 Ploughmeter (a) during insertion and (b) in operation. The forces recorded by the strain gauges, which are pre-calibrated by bending the ploughmeter in the laboratory, can then be interpreted in terms of the strength (Fischer & Clarke, 1994; Fischer et al., 1998a) and sedimentology (Fischer & Clarke, 1997b) of the subglacial sediment layer. The dragometer (Fig. 76.5), which is an instrument closely related to the ploughmeter, was developed by Iverson et al. (1994) to measure sediment strength beneath Storglaciaren by dragging an object through the subglacial sediment and measuring the force on the object. The instrument consists of a 100 mm long and 19 mm diameter cylinder with conical ends, dubbed the 'fish', which is connected to a steel wire. The other end of the wire is fed through the bottom end of a 1.9 m long and 19 mm diameter steel pipe and is attached to a load cell which is housed in the upper end of the pipe. 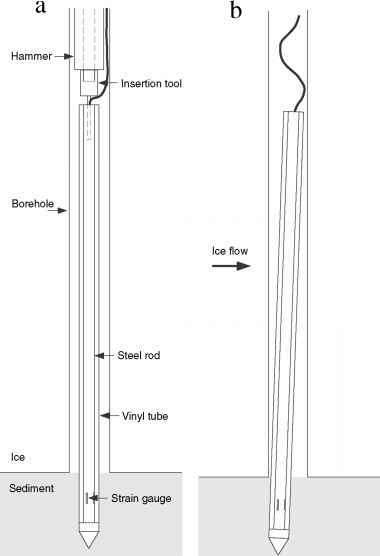 Both pipe and fish are lowered down a borehole and driven into the soft substrate with the subglacial hammer and an insertion tube similar to that used for the subglacial tiltmeters (Fig. 76.5a). Eventually, owing to the forward motion of the glacier, the wire becomes taut and the fish begins to be dragged through the sediment (Fig. 76.5b). The length of the wire is chosen such that the fish is positioned beneath the ice rather than beneath the borehole as it is dragged behind the base of the pipe. This configuration has the advantage that—unlike in the case of the ploughmeter—measurements are not made at the base of the borehole where effective normal stresses are likely to be perturbed. Prior to insertion, the dragometer is calibrated by fixing the pipe horizontally and hanging weights on the wire at a right angle to the pipe axis. Measurement of sediment strength with a ploughmeter or dragometer is only appropriate when subglacial sediment is sufficiently permeable that compression in front of the ploughing object (i.e. base of the rod in the case of the ploughmeter or fish in the case of the dragometer) does not result in pore-water pressure in excess of hydrostatic pressure (Iverson et al., 1994; Fischer et al., 2001; Rousselet & Fischer, 2005). Where perturbations of the ambient pore-water pressure in the sediment by the measuring device cannot be precluded (e.g. 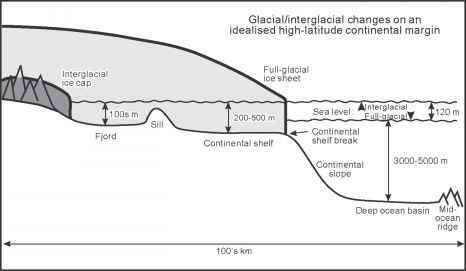 beneath glaciers that slide rapidly over impermeable subglacial sediments), the pore pressure should be measured or estimated and factored into the data analysis. Rousselot & Fischer (2003) have experimented with a new version of the ploughmeter which is equipped with an integral pressure sensor. This pressure sensor enables the measurement of pore pressure in the sediment at a pressure port located in the tip of the ploughmeter. A rudder mounted onto the tip ensures that the pressure port rotates into the direction of flow as the glacier slides forward and the tip is dragged through the sediment.